Think age is a barrier to getting into running? It may be time to think again. 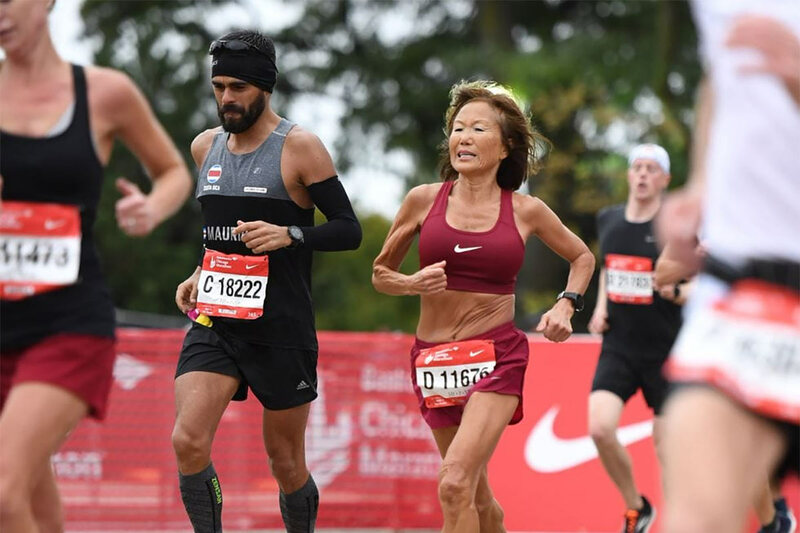 While four-time Olympic gold medalist Mo Farah was busy winning the recent Chicago Marathon, eagle-eyed viewers may have spotted somebody else breaking records – 70-year-old Jeannie Rice. The estate agent & amateur runner finished the race with a time of 3:27:50, smashing the 70+ women’s record previously set by German Helga Miketta in 2013, who clocked in at 3:35:29. Even more amazingly, she was back in work and wearing heels like nothing had happened a mere two days later! Like many of us, Jeannie took up running as hobby because she wanted to lose weight. Originally from Korea, she settled in the United States as a teenager and remembers putting on weight when she traveled back home to visit her family. She went out jogging a few times and discovered that she was a natural – and before she knew it she was entering local races and placing near the top of the leaderboard. The rest, as they say, is history. Jeannie’s first marathon was in Cleveland in 1984, with a time of 3 hours 45 minutes – which she squoze down to 3 hours 16 at her next marathon in Columbus. Since then running has taken her around the world, to countries including China, New Zealand, the Czech Republic, France, the UK, Spain, Ireland, and Iceland. Her most recent race in Chicago brings her total up to an incredible 116 marathons. She prefers running to other sports, as you can fit it around your lifestyle and you don’t have to rely on other people. ← The Beautiful Game: Which team has the most eco-friendly stadium?